Stuff I Painted Over the Christmas Break | H.A.W.K.S. A few days ago, I posted some pictures of female cuirassiers. This is a rocket artillery battery that goes with those figures. I really like the way his figures look like girls without being ridiculously proportioned. 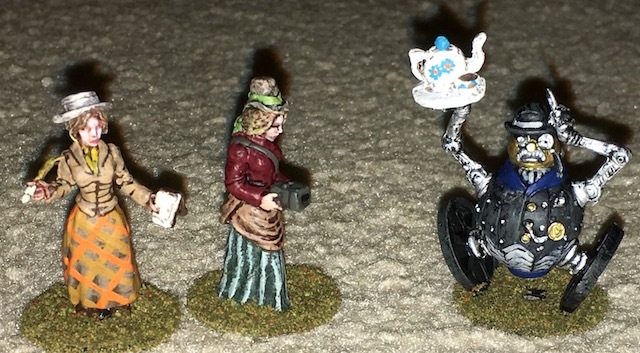 The lady reporter, lady photographer, and robotic butler. Some kind of bird beast and a hatchling. While at the Pennsylvania Renaissance Faire, I picked up these last few figures. They were somewhat over priced, but they were unique and fun to paint. I ordered some hobbit cavalrymen from The Assault Group to mount on Baker Company reindeer to give to my buddy Chris for Christmas. In the package with the hobbit riders, they included these three hobbit figures. I can’t stand to have unpainted lead around, so I knocked these out. 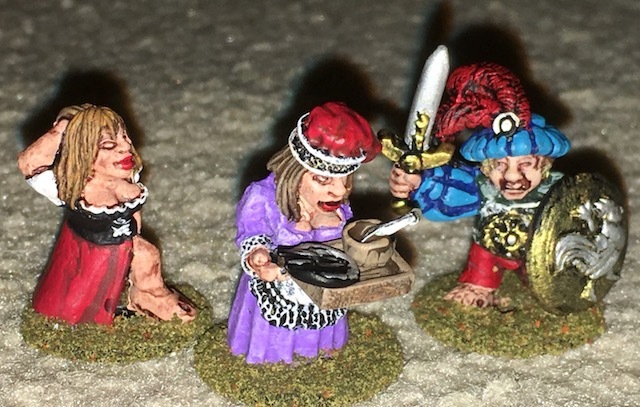 Hobbit harlot, bar maid, and warrior from The Assault Group. Chris gave me these very cool science fiction figures from a Russian company. Female science fiction soldiers. Chris painted these like my Pulp Figures Venusian women. These could be Venusian warrior women 100 years later.